Frontline Spot On for Cats is for use in the treatment of fleas and the prevention of infestations by fleas and ticks or as part of a treatment strategy for Flea Allergy Dermatitis. Frontline Spot On for Cats 6 pack can be used on kittens from 8 weeks of age. Dosage 1 pipette of 0.5 ml per cat (approximately 7.5 - 15 mg/kg); follow the instructions on the packet for correct application. This used to work but hasn't done this time so I will be trying something different. I rate this 5. It is safe, quick & easy to apply to my cat. Fantastic product I can't fault it at all really works. easy to administer, gives you stickers to remind you when to administer- two flea free cats here! Best flea treatment on the market! My cat has not had a single flea on her since I've started using Frontline. The six pack is great, lasts so long for 1 cat! I go through so much of this as I have many cats. I defiantly trust this brand and completely swear by it. Highly recommend. I have used Frontline for years and have recently found that it no longer works on my cat. I will be trying a different flea product in future. Any suggestions for a product that does work? First time buying Frontline from VetUK, very fast service ordered Thursday afternoon and was here Saturday morning. Tried other flea treatments but Frontline is the best we have used. I have two cats and always use this product to maintain flea-free felines! Its easy to use & the cats don't mind having it applied at all. I always buy it from VetUK as its so much cheaper & delivered to your door very quickly....why trail about & waste time/petrol? Its a good idea just to keep hold of your cat for a few seconds after applying as if the cat shakes itself immediately after application some of the fluid can be shaken off. I have 7 cats. Four are house cats and the other 3 go out. I also have 3 dogs. I use Frontline on them all and have never had a problem with fleas. I know because fleas always bite me! Ticks just drop off after a day or two. It's easy to use and the cats don't freak out at the odour! Good stuff! Thank you for sending this product so fast! Got it 2 days after ordering and I kicked in the whole regime I have for getting rid of my cats fleas. I use normal household fly spray around the house, carpets, soft furnishings and bedding, and Frontline on the cat, outside out of harms way. Fly killer is surprisingly effective! ;) Just don't use it on the cat! Use it in your home going backwards towards either back door or front door. The cat shpuld already be out of the house, and any other pets, as it is toxic to them in such a high amount. Poor Smudge, he has a terrible allergy to fleas and we just moved into a house infested with them! Arrghh! 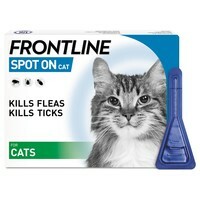 I have 2 cats and have been using frontline for some time now, i have to say it works great on my female cat, but for some reason my male cat has still been getting a good amount of fleas recently, even with regular use of frontline, so after reading up i have decided to change him to frontline combo and see if that suits him better, and hopefully we will keep those pests under control. Frontline is the best flea product as I discovered many years ago when my housemate's cat got fleas and we tried everything else with no success. Since then I have cats of my own and have always used it regularly on them and there's never been a flea in sight. It's very expensive from the vets and other places, but now my cats and house are flea-free at a reasonable price thanks to VetUK! Effective and fairly easy to use. I would've given it five stars except that it is a bit pricey; now I use Fiprospot Cat instead because I find it works just as well though it's less expensive. I have used frontline on my pets for years and although I occasionally find a flea on my cat it is generally very effective. I have stuck with fronline because it also protects against ticks which not all the other spot on treatments claim to do. VetUK offer the best price and prompt delivery. Much cheaper than the vet, i use regulary and have not had any signs of fleas ever. This is the first time I have used frontline as my cats always had flea collars. It was recommended to me by a friend and I would never go back to collars again. There is no strong smell that you get with collars and it is so simple to use. I have had no scratching from my cat so it appears to do what it promises. Next day delivery fab product, best price on Internet. Absolutely fantastic value and superb service. I recommend to anyone who will listen! Why pay treble (or more) the price buying direct from your vet when you can buy the exact same product at these prices. It's a no-brainer! I bought a year's supply for our two cats for a fraction of the cost from our vets. Excellent company to deal with. Best price and value for money on this product from anywhere. Much cheaper than buying from the vets. Service is excellent - delivered promptly and efficiently, and the website is easy to use, and products easy to order. I used this for years, with no problems whatsoever; recently, though, we had a flea infestation. Frontline does not seem to be very effective anymore. I had to treat the whole house several times and switch to Advocate (prescription only). I routinely use Frontline as my flea treatment product of choice and only on one occasion have I found it to not be completely effective. If I'm ever asked which cat flea treatment to use (admittedly, not a common occurrence!) I'd always suggest Frontline first. I am a new customer of Vet UK and find the website very easy to use, have made my first purchase of frontline, excellant service and kept informed on progress of my order. I will be using Vet UK for any future orders. I ordered 2 of these 6 packs as I have 7 cats and they all recently had a flea problem. It worked very well and very quick :) ..The products got here REALLY fast also. Best price for this product, and delivered very next day. Great product and service. I'll be using VetUK all the time now. I've used Frontline ever since it's been available. It's the best! I've used VET UK ever since I discovered them. They're spot on for delivery and price! I have used frontline for 5 years it is the only flea treatment that works on my moggy. It costs me much less buying online at vetuk than local vets. Vet UK is the best. This is a have to have item. I have two strays; which do come into my home. They are slowly being tamed; BUT I can't tolerate insects...and fleas are a definite no-no. I have bought this from Vet UK; for nearly the last two years. They are quick to deliver; and this item - does the job. I took the strays in to be neutered; and the vet was very surprised; that being strays - they were insect free. So, keep up the good work!!! I have been ordering for 1 year for my frontline cat and this is the cheapest and best service I have found. I wwouldnt buy my frontline anywhere else, thankyou. I have previously purchased this item and will be due to again in a few months, but this service is fantastic. My vet charges 25.95 for this 6 pack alone a total nightmare. hi ordered frontline on a Friday morning and it came on the Saturday. My cat had really thin fur where he scratched so much, within a month it had grown back and now after treating him for 3 months he has got no fleas and a lovely coat again! Hi i ordered this product on the Tuesday it was with me on the Wednesday, really pleased, also have 2 happy cats ! This is my second purchase and an excellent product that does exactly what it says. The price is the cheapest ive seen, and i recieved my product within two days. I have recommended you to so many friends, and will keep on coming back. Thankyou. I am exceedingly pleased with the reasonable prices and impressed with the speed of delivery - I received my Frontline at a fraction of the cost from my Vet within two days of placing the order. I have spread the word about your website and will deal with you again! I know Frontline is brilliant - just wanted to say what an excellent service VetUK provide. I ordered Frontline on Sunday evening and it arrived on Tuesday morning and at a fraction of the price I would have paid at my vet's surgery. WHAT AN EXCELLENT BUY , A1 ON DELIVERY AND SERVICE. WILL DEFINATELY USE YOU AGAIN, AND I TELL ALL MY FRIENDS TO GO ON THIS WEBSITE WHO HAVE ANIMALS. I was very pleased with Frontline Spot On. This is the first time I have used it and definately will continueto use. Does exactly what it says on the tin- no more fleas! Also pleased with fast delivery. This was my first time using Vet UK and it won't be my last! Thank you for an excellent service and I was extremely impressed with the quick delivery of my order. I will definately recommend your company to my friends. Thankyou for a fantastic service. Have recommended you to friends. Frontline is great. Used it on my cat on Saturday morning and the fleas were literally dropping off her by Saturday night. I've used it in conjuction with Acclaim flea spray for the home which I would definatley recommend. Thanks VET UK, for delivering so quickly. I ordered Friday morning and got a delivery Saturday morning.... I was gobsmacked! Hi,just like to thank you for a great service in price and delivery. Believe it or not Frontline was £15.53 for 3 pipettes at our vets so your price was brilliant and I ordered straght away being very impressed when my order arrived the next day. Once again thanks for a truly superb service. I have always used this product and with 3 cats it gets very expensive from the vets!! I can't believe the value for money or excellent sales service I received - I will be using Vet UK again, and with a new puppy arriving soon this will be a bonus! Have recommended this site to all the pet owners I know. Just to say what fantastic service I have received!! I ordered a pack of 6 Frontline spot on at 1pm yesterday (11 August 2006) and it arrived here by first class mail at 8am today (12 August 2006)!! Not only do you give excellent service but you are also the cheapest - how do you do it?! Needless to say this was my first time with you and it definitely will not be the last! Well done and thank you K.B.